Thanks Aditya for the August report. August was a tough month for the Indian automobile industry with devastating floods in one of the biggest automobile market –Kerala coupled with the festive season in the state. For some like Maruti Suzuki whose has a Market share of ~ 59% has taken a big hit while other OEM’s too had a similar story but to a lesser extent. -	If NEXA is a brand then it will be the 3rd largest auto in term of sales, shows a growth of 3.4%, and contributes 10.2% to Maruti Suzuki’s market share. -	Baleno is relentlessly supporting Nexa as a brand and contributes ~62% of Nexa’s sales. -	Maruti + Nexa Market Share is still >50% (51.6% to be precise) and both brands together. -	Top selling cars remain the same with a variation in order. 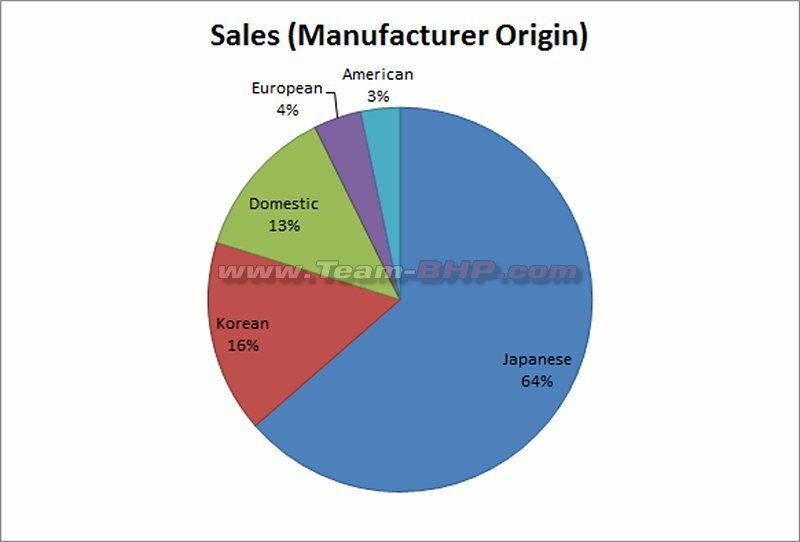 -	Top 10 best sellers is a story of the top 2 OEM’s with Honda pitching in with Amaze. -	Apart from Tata, Toyota & Ford ( low base reference and new launches) no OEMs registered a YoY growth. Automakers dispatched 2,58,722 cars, utility vehicles and vans to showrooms in the past month, continuing the trend of increase for the 14th consecutive month, prompting SIAM to boost its market growth projection for the financial year to 10-12%. -	The Leader Maruti Suzuki hits a blip over various factors with Kerala flogs contributing the most. But still it grabs 51.6% Market share. Ciaz straight away zoom pasts all competition, Alto retains the best-selling car, Swift , DZire doing brisk business. Baleno and Vitara Brezza are the star performers. S Cross is expected as the variant jig has been updated. Ertgia’s drop too is on controlling the inventory before the new Ertiga launch. -	Hyundai Motor India, the country's No. 2 PV maker, too felt the pressure of slowing sales. Lots of expectation on its biggest launch this year – Santro, in October. -	Mahindra & Mahindra, with the launch of its new Marazzo MPV expects to ring fence its 3rd position this year ( 2 more launches this year). 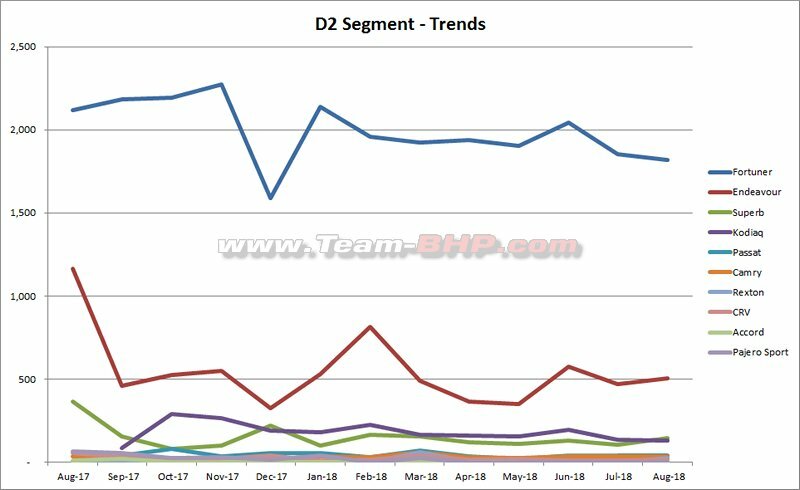 Sold a total of 19,758 units in August 2018, 1.81 percent up YOY. -	Tata Motors, which is riding a wave of demand for its PVs, continued its growth trend, higher by 28 percent .Nexon beats the seasoned Ford EcoSport and attributes the Nexon as the reason. -	Honda Cars India registered a down of 1.98 percent. Cannibalization seems imminent and Amaze does it and it shows in the figures of City. The sedan falls a new low behind Verna and Ciaz. New launch of CR-V expected in October but do not expect any drastic increase in volumes. -	Toyota Kirloskar Motor which marks YoY growth of 17 percent. Innova Crysta and Fortuner bring in the numbers while Yaris gets a luke warm response. Going forward for Toyota the Maruti Suzuki alliance and the EV programs are the ones to look forward to. -	For Ford the Freestyle seems to have made it and after its launch in April the crossover hatchback has been consistently selling around 2,500 units each month. EcoSport, Ford’s the other Ford will look forward for some support and with the launch of the new Aspire in September. -	Skoda and Volkswagen will have to await till 2020, but will face an herculean task as the Country will see the first batch of EV launches to the mass market. No amount of face-lifts and special editions can pull the group from the current slot it is in today. -	Renault’s experiment with the Captur hasn’t worked as the company expected defying the mass perception already set in with the Captur. The Kwid’s mid-life update hasn’t provided the micro-SUV any added numbers. Will need to await its new launches while nothing concrete is known yet. -	Nissan is reinventing itself in India with a new action plan in place. All eyes on its SUV Kicks which is expected to do some volumes and help Nissan’s growth plan. -	Jeep, Fiat’s only hope in India, has done well with the Compass but sees a down trend . Could follow the VAG pattern as no new launches expected until 2020 and beyond. Last edited by volkman10 : 10th September 2018 at 13:45. Mahindra is laughing its way to the bank with the Bolero. It contributes the most to its overall numbers. There seems to be no other competitor in that segment! If Tata is serious about retaining its place in the top 3 PV for a long time, it's *got* to have a product that competes with the Bolero and one that's as good and takes marketshare from it. Viz. Rural markets, airport tarmac utility vehicles, construction crew pickup trucks, etc. 1. Dzire does seem to be feeling the Amazing heat. First few months of Amaze launch was possibly taken care by over stocking by Maruti at dealership side - but now the impact is showing. Still Dzire is the king of the hill. In this segment, I don't think anyone looks for options beyond Honda, Hyundai and Maruti. What more can you want out of your compact sedan that these players can't offer. And buyer mindset is anyway conservative at these price points. 2. Good to see Nexon holding on to dear life. But JUST ... Ecosport missed the Top 10 mark by <100 units and doing very well for itself too. 3. Amaze sales definitely having an impact on City sales I feel. But overall growth + hopefully better profits shouldn't worry Honda. 4. Marazzo opens its account with this month. Hope to see 2k numbers on this car regularly. Petrol and automatic needed but I feel that for a true people mover, a diesel will be more economical despite the reducing cost differential between the 2 fuels. 6. The 10k Creta market is what the Tata Harrier should squarely target. A slight premium should be ok but not too much. Thanks Aditya for the monthly sales report for August 2018. 1. Toyota has crossed the 14K mark after a long time (if you discount July 2017, when the sales has increased due to GST implementation and sold 17,758 units), which was way back in March 2013 when they sold 19,452 vehicles. 2. Tata has moved up to 3rd place once again beating M&M and Honda and hope they consolidate this position with the upcoming launch of Harrier. 3. 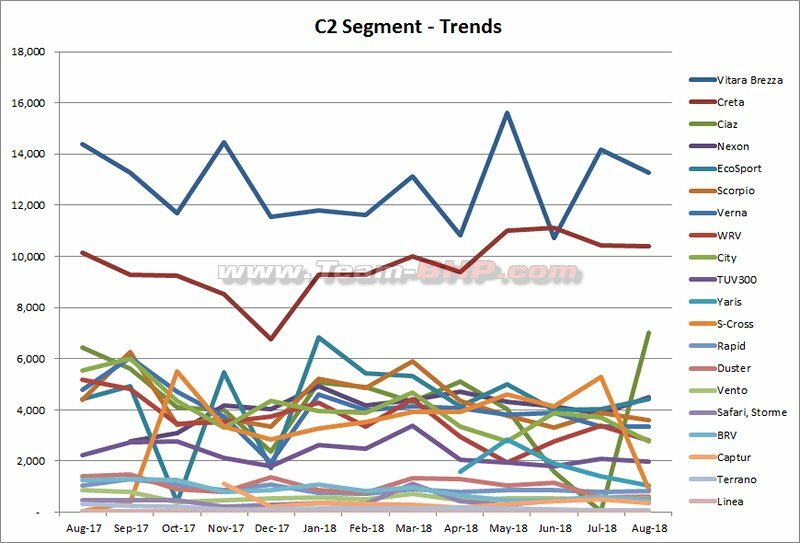 The facelifted Ciaz started very strongly posting its second best ever sales number since launch and also only the 2nd time crossing the 7K mark (the last time was Apr 2017 when it sold 7,024 units). 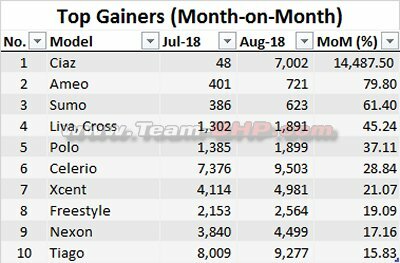 This has consolidated its position at the top followed by Verna however the Yaris has fallen to just a shade over 1,000 units in just the fifth month of its launch. The Petrol only option is going to face further pressure since the facelifted Ciaz now has a better Petrol mill. 4. The new generation Amaze continues its dream run by once again entering the Top 10 postions and was still able to maintain more than 9K levels. However, the new generation Dzire yet to dip below 20K units which is unmatched. 5. Similarly, the facelifted i20 and Creta are yet to dip below 10K units which is indeed commendable. 6. The newly launched Marazzo has moved 1,762 units which seems decent but not good, we may have to wait and watch for the next few months on where it will settle. However, this seems to have some impact on their own stablemates like XUV which sold almost 700 units lesser. 7. Punto and Linea has achieved their best monthly sales of this year - although they are paltry 76 and 21 units. 8. After a life time high last month, S-Cross hit a trough by selling under 1000 units - what happened there? And "0" Gypsy? 9. Tiago broke into 9K level for the first time and recorded its life time high, however Celerio has upped the game and beaten it this month. While Tiago is on a rise, Tigor is on a downward spiral recording the lowest monthly sales of this year and 2nd lowest month since launch. 10. Had VW committed a blunder by launching the Ameo which is selling under 1,000 units and also hurt its own siblings Polo and Vento in the process? 11. 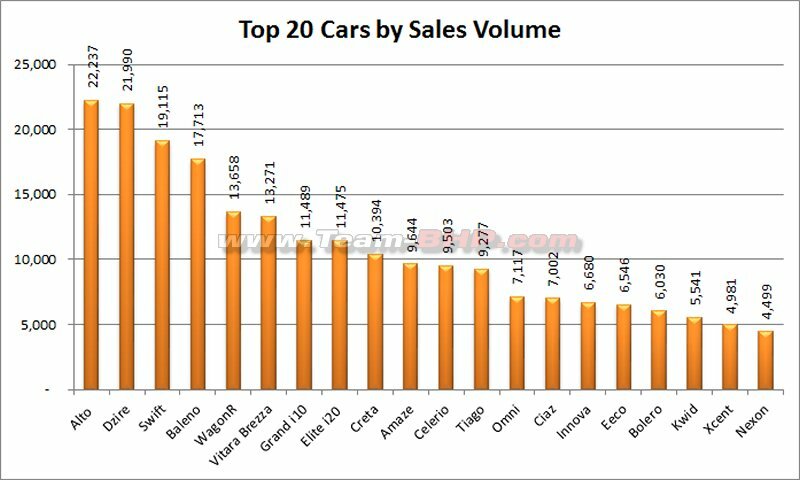 The consistently excellent sales of Alto, WagonR, Swift, Dzire, Baleno and Brezza is amazing and they are almost selling more or less the same number of vehicles month after month. Last edited by jpcoolguy : 10th September 2018 at 14:12. Looking at the trends of both INDIAN origin manufacturers, TATA & Mahindra, who are in close contest for 3rd & 4th places month on month, my views are. 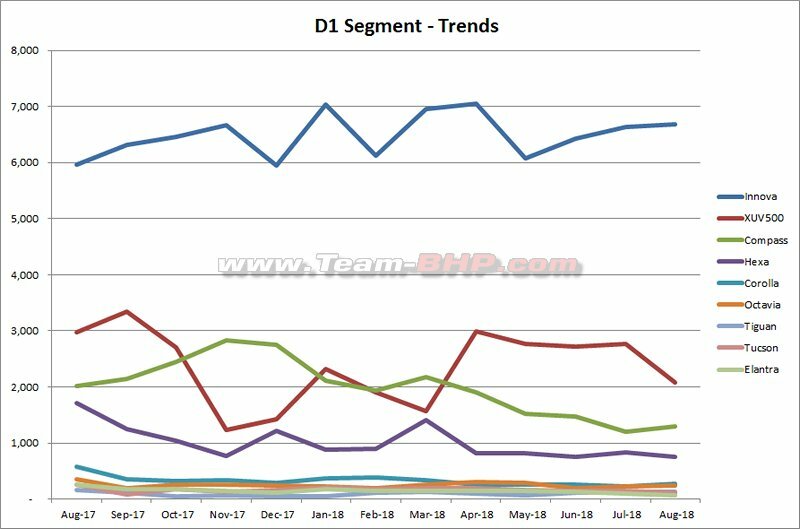 1) The entire Mahindra range has seen a constant month on month drop for all cars with even the Bolero, which by far has been a strong player along with Scorpio for many year, has seen it numbers drop month on month. 2) The recently face lifted XUV 500 dose not seem to have helped improve the numbers, with a 30% drop YoY. Meaning that Mahindra needs a complete revamp of their line. 3) Is Marazzo the sliver lining as i don't see any other vehicle from Mahindra that would play the volume game. 1) With Nexon and Tiago having positive trends seems like they are heading in the right direction. 2) Sumo is one car which i feel TATA should put full efforts to rejuvenate. 3) Sadly the Tigor seems to have no takers, could it be the engine or the unconventional back. 4) Not sure why TATA is not pulling the plug on the BOLT it seems dead long back. With TATA having some smart cars on the way, hope they can consolidate their position and move closer to Hyundai. 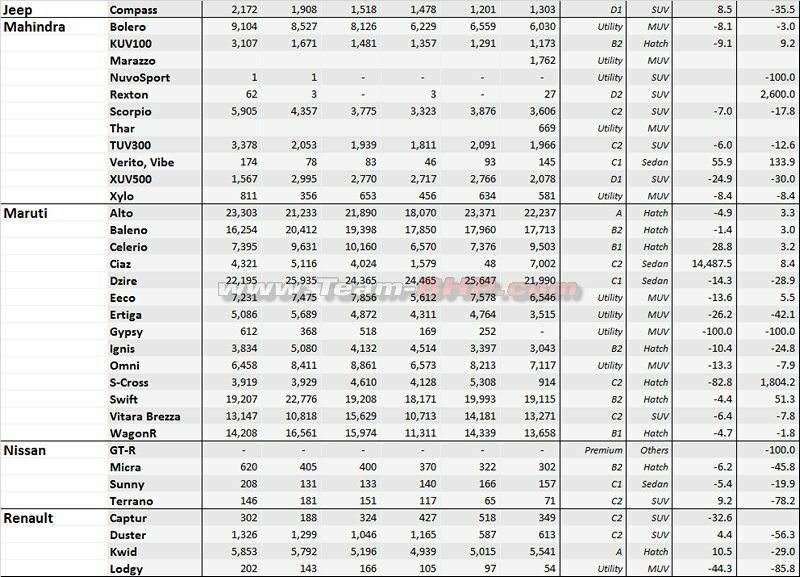 How often do we see a Honda in the top 10 sales figures? Amazed at Amaze - 9644 units is very impressive. 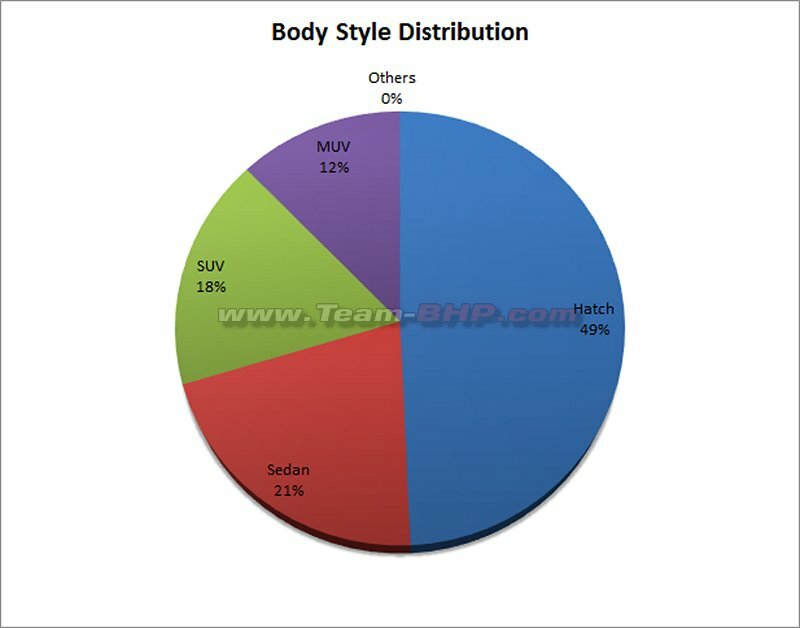 Still, half of the Dzire's 19,115 units. On the other hand, Ciaz does 7002 units compared to City's (Honda's breadwinner in India!) 2790 units. New Ciaz is now capable of taking on City? But, Captur is in the top losers MoM. It truly must take something special to sell such small numbers and consistently end up in top losers every month! Marazzo at 1762 units is a good start. But quite some time away to judge if the shark has any bite to it! Although the Crysta seems to be shrugging off the challenge (if any!). Tata has a true star in Tiago. In hindsight, calling it the Zica would have been apt. Its spreading like a virus. Datsun - RediGo is the only way to go. These guys should put everything behind this car. Have the Go and Go+ in single basic trim for fleet markets only. Fiat - Why bother running the shop? Concentrate on the Jeep brand. Ford - Aspire / Figo on (all time?) low numbers, presumbaly in anticipation for the release of facelifts. Let's hope that the facelifts see better numbers. Freestyle / Ecosport / Endeavor doing consistent MoM numbers. 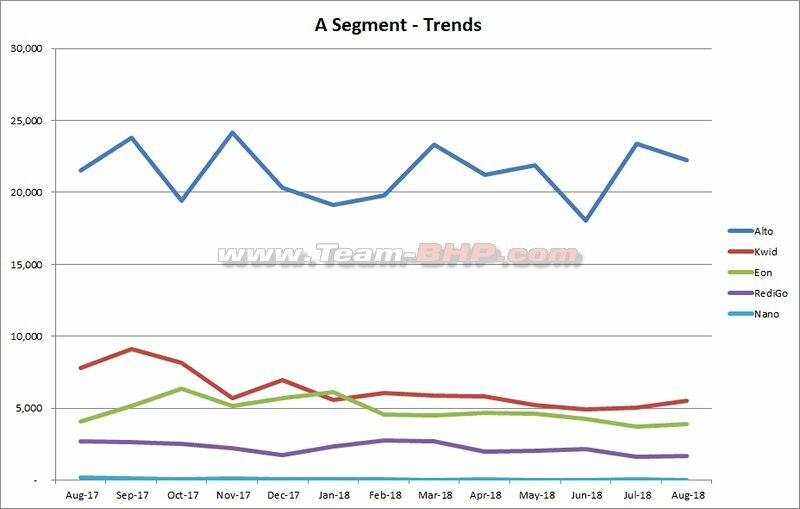 HM-Mitsu - Is it a norm of tbhp to not drop a brand in case it has any sales in the last 6 months? In that case this should be the last time we see this name in the list. 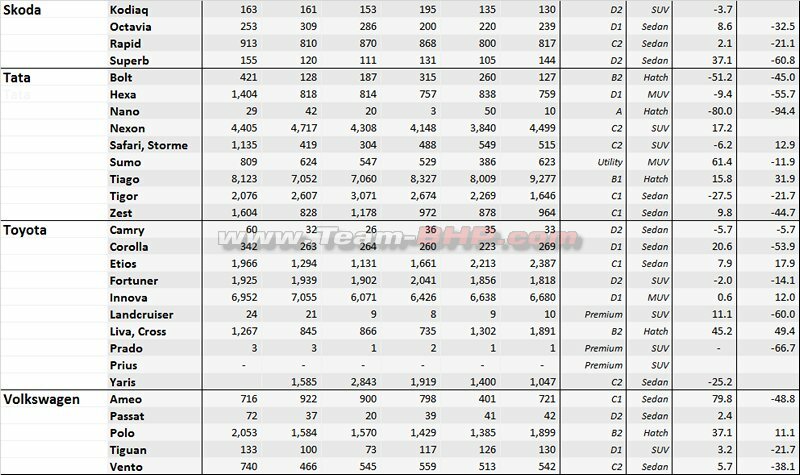 Honda - Amaze continues to amaze with solid MoM figures close to 10k sales.City takes a hit (new Ciaz effect? ), while WRV graph has been sawtooth for the last few months. The feacelift(?) cannot save the Jazz numbers. Jeep - high time FCA jumps in to save this brand with updates. 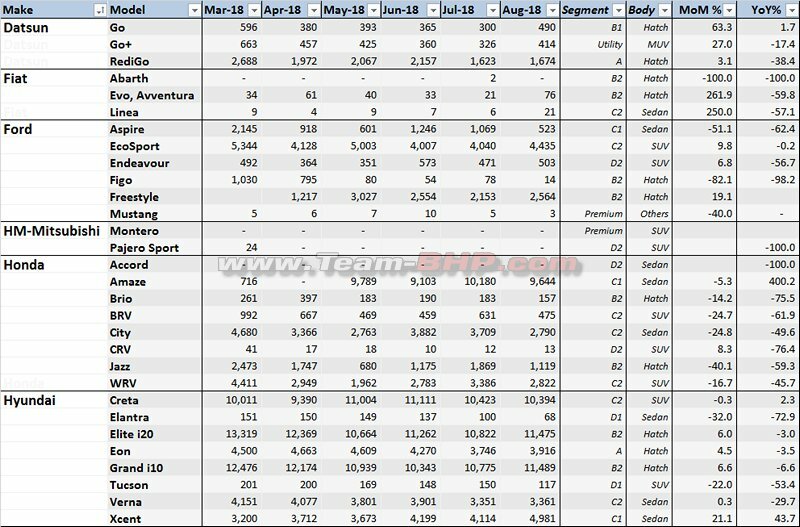 Mahindra - 1700+ is somewhat low number for a brand new launch (Marazzo). 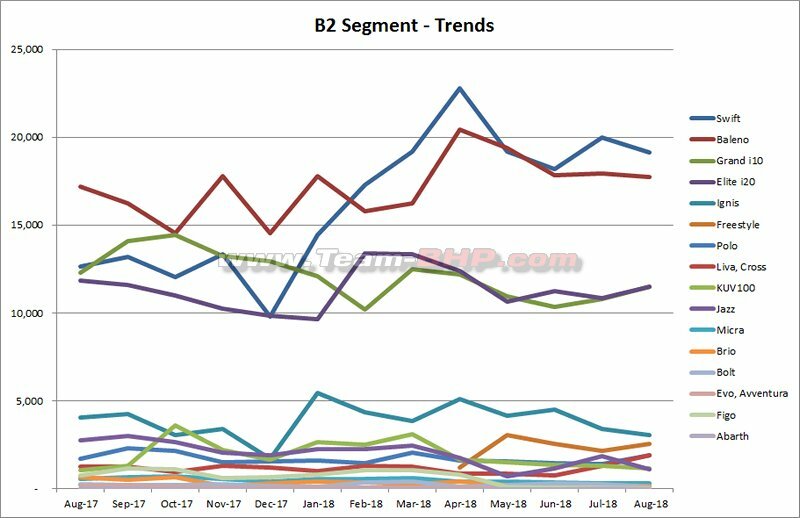 Bolero numbers have been falling consistently for the past few months, who's winning that business? Scorpio / TUV pretty much consistent. XUV sees a sizable dip. Nissan - Close on the tails of brand Fiat (going) & GM (gone) if they don't make immediate amends to the way they do business. Tata - Good news flowing in in form of Nexon & Tiago. Should take market feedback and update Tigor to increase sales. Snip other sales duds / old models to make way for newer models like Harrier / Hornbill etc. 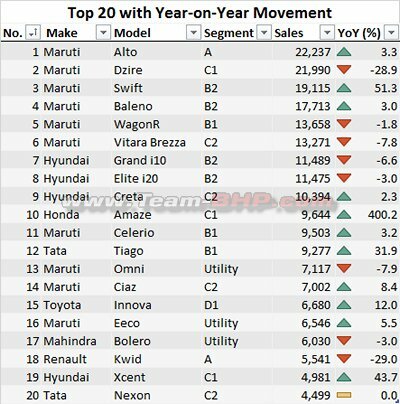 Totyota - Fortuner & Innova continues to do mind boggling numbers at respective segments, so that other sales duds are covered. Yaris failed to crack the stronghold of the City-Ciaz-Verna trio, and numbers continue to fall. VW - Seems ambivalent to lesser than average numbers for all the models in it's lineup. Last edited by blackasta : 10th September 2018 at 15:45. I think anyone who has followed the sales thread for a few months can recite the top 20 by heart. Has remained mostly consistent. Honda seems to have really cracked it with the Amaze. Consistently doing 9k numbers. I think if Honda had the reach of Maruti, Dzire would have been under some pressure. But even with that , Honda is now in 5th place. I guess Yaris is not doing as well as expected. Less than 2000 when the Ciaz is doing 7k now. 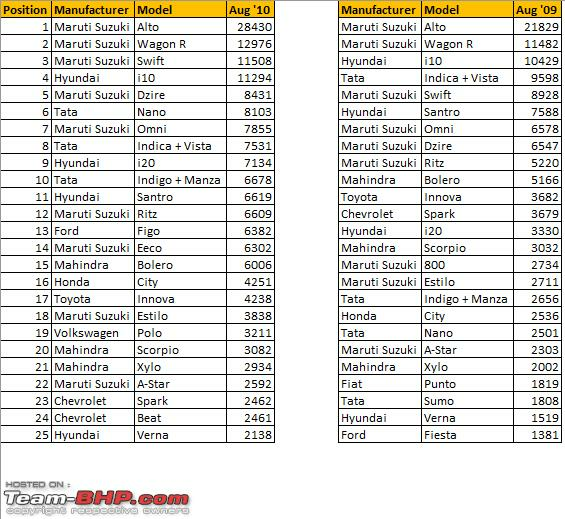 Good to see Tiago consistently do well for Tata and the Nexon also holding on to its numbers. Tata is a manufacturer trying pretty hard and good to see consistent success. 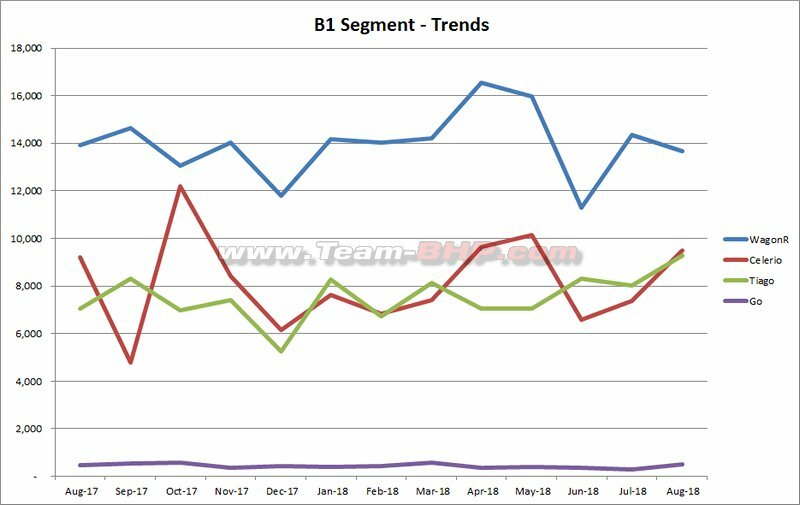 Overall, apart from a few variations here and there with respect to the models, the sales picture has remained fairly consistent as always. Not sure if that is good or a bad thing. Last edited by Rajeevraj : 10th September 2018 at 15:50. * Why Kwid has dropped to 5k, it used to do around 9-10k numbers? Is it their sales & service or perception of people? Or the discounts offered by Maruti time to time? Kwid is a better product then Alto. * How are Fiat dealers surviving at such low numbers? Is Fiat assisting them? 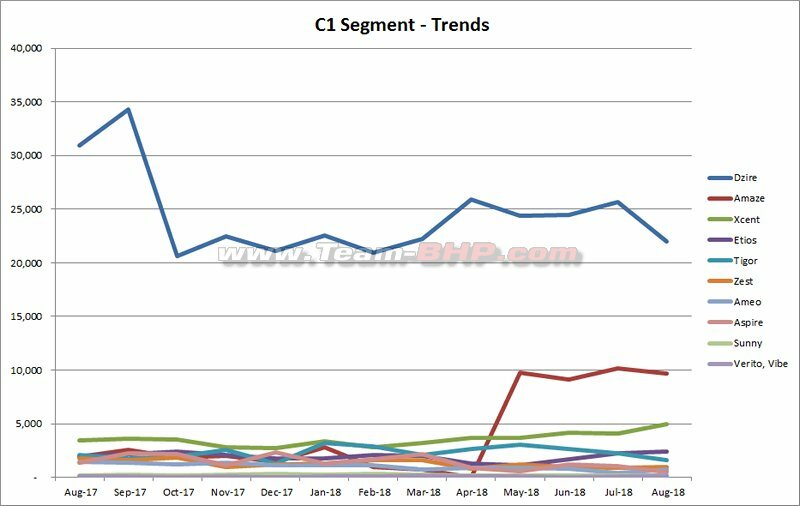 Even the Jeep Compass is showing a downward trend. Fiat strategy (laziness) baffles me. * Skoda though doing low numbers has found consistency considering their products are above the million rupee mark while VW is struggling. * Tata needs to capitalize on success of Tiago and Nexon. They shouldn't resort to illogical cost cutting that they have started recently (E.G. Hexa). Tigor badly wants a better engine. Please stop the NRG and KRAZ editions. * Is Mahindra following Tata's footsteps of going from peak to summit and then resurrect one day? 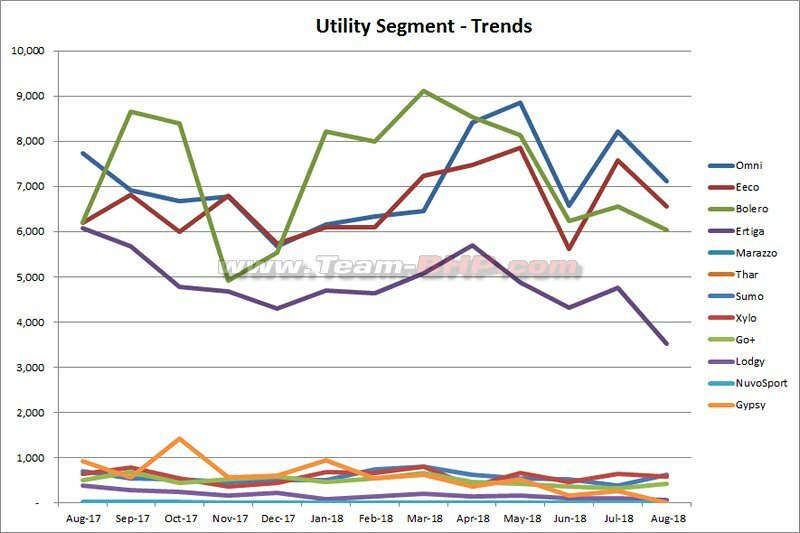 Old lineup, oddball styling, declining numbers. Marazzo seems a breath of fresh air though. * What is Nissan smoking? 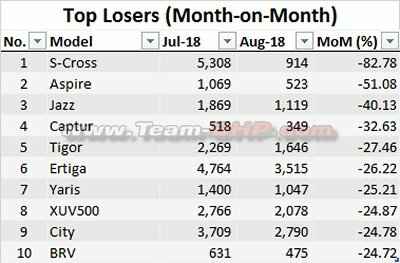 A look at Top 25 vehicles in the month of August for the last 10 years.